BIRMINGHAM, AL – Aug. 4th 2014: Author Givon Wayne has written an amazing piece of literature with his newest release “Cooka-Mamma-Fobio”. 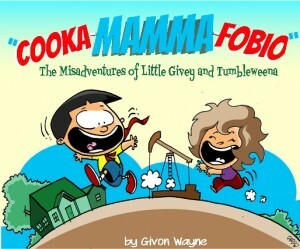 This E-book is a humorous collection of 10 fanciful stories that children and adults will love. Givon’s book is loosely based on the early childhood of Givon Wayne and his younger sister, Trena Kay. They spent a few years growing up on a small farm located on the outskirts of Odessa, TX. Life was much different in 1973. There were no cell phones, seat-belts or video games. Freedom and boredom were the seeds of creativity, and these two kids had plenty of opportunity for both. This book is a must read that you are sure to recommend to friends and family. It is available now via the iTunes store. This entry was posted in Books and tagged and, Books, givon, publications, spotlight, wayne's by product reviews. Bookmark the permalink.